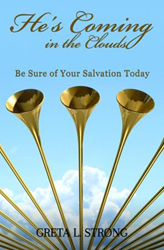 Greta Strong’s new book, He’s Coming in the Clouds: Be Sure of Your Salvation Today, ($17.99, paperback, 9781545612149; $8.99, e-book, 9781545620809) calls to prepare the world for Jesus’ return and is meant to help Christians align themselves with God. Based on biblical facts, Strong’s book sheds light on what the Bible says about eternal life. Greta Strong is a wife, evangelist, and teacher of the Word of God. She is in the process of earning a master’s degree in biblical studies. She has worked as a senior events director and district manager, and has extensive management experience. Xulon Press, a division of Salem Media Group, is the world’s largest Christian self-publisher, with more than 12,000 titles published to date. Retailers may order He’s Coming in the Clouds through Ingram Book Company and/or Spring Arbor Book Distributors. The book is available online through xulonpress.com/bookstore, amazon.com, and barnesandnoble.com.